The Macron East Sussex Football League will provide one of the finalists in the Sussex Bluefin Junior Challenge Cup. Division Two high-flyers Sovereign Saints and Division One promotion hopefuls Bexhill AAC will face each other in the semi-finals at Shinewater Lane tomorrow (Saturday) after both teams won their quarter-finals in West Sussex last weekend. A Bexhill Rovers player helps the ball forward against Catsfield. A Philip Broom double earned Saints a 2-1 win away to Bognor Regis-based Nyetimber Pirates II, while Andy Atkin’s second half strike gave a depleted AAC side a deserved 1-0 success against Lavant II in Chichester. There was further success for the league in the National Christian Cup as holders Battle Baptists triumphed 5-1 in their quarter-final away to Selhurst United. Trystan Mayhew’s hat-trick, and one apiece from Tom Saunders and Dale Vinall (penalty) earned Premier Division leaders Battle a terrific victory in Beckenham, and set up a semi-final trip to Bolton or Liverpool. The vast majority of last weekend’s scheduled league and cup matches went ahead as the dry weather of the preceding days allowed the pitches to dry out. The heads go up at a Bexhill Rovers corner during their 2-0 defeat to Catsfield. Hollington United took full advantage of Battle’s cup commitments by winning 7-0 away to Crowhurst and moving within two points of their title rivals having played a game less. Callum Smith (2), Ashley Kidman (2), Luke Woodley, Daniel Hull and Ricky Martin scored for a Hollington side which remains unbeaten in all competitions this season. Third-placed Rye Town were the day’s highest scorers after coming from behind to win 10-1 away to an Ore Athletic side which had two players sent-off. Richard ‘Alfie’ Weller struck four times in the second half, while Charlie Stevens and Chris Gould both netted hat-tricks for a Rye side which is level on points with Hollington, albeit having played three more matches. Bexhill Rovers and Catsfield tussle for possession. Sidley United strengthened their hold on fourth place by winning 2-1 at home to St Leonards Social. A goal in either half from Sean Baldwin and Arron Scrace put Sidley two-up before Shane Ryan pulled one back for Social. Division One’s bottom club, Little Common II, picked up only its second league victory of the season with a 4-2 win at home to second-placed Westfield II. Strikes by Jordan Harris (2), Toby Smith and Conor Chilton for Common ended Westfield’s eight-game unbeaten run in the league stretching back to September. A Bexhill Rovers defender holds off a Catsfield forward at Gunters Lane. Hastings Rangers won for the first time since October - and jumped up to fourth in the process. 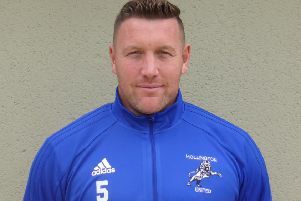 Goals from Mark Blanche, Mark Larkin and Louis Loureiro earned Rangers a 3-1 victory at home to second-bottom Herstmonceux, who are now just four points above Little Common. In Division Two, second-placed Bexhill United II contested their second successive goalless draw in the league, this time at home to Battle Baptists II. Bexhill would have gone level on points with leaders Icklesham Casuals had they won, albeit having played two more games, but instead they find themselves two behind. Draw specialists Wittersham gained only their second league win of the season with a 3-1 success at home to Mayfield. Thomas Jebb, Jonjo Andrews and Nathan Jackson scored for Wittersham, who moved above Battle on goal difference and out of the bottom two. Oli English netted for a fourth-bottom Mayfield team which is now just a point above Wittersham, albeit with two games in hand. The one Division Three fixture to go ahead ended in a 2-2 draw between Pebsham Sibex and The JC Tackleway II. The goals of Lewis Remmer and Dean Fuller earned Sibex a point, which was enough to take them above Sandhurst on goal difference and up to third. Jack Still and Chris Aldous found the net for sixth-placed Tackleway. There was no change at the top of Division Four as the two matches played didn’t involve any of the leading four sides. Fifth-placed Sovereign Saints II won 5-1 at home to bottom team Burwash via the finishing of Vince Rembridge (2), Riki Prodger, Zach Taylor and Tyler Henshaw. Cranbrook Town moved up a place to sixth on the back of a 2-0 triumph at home to second-bottom Parkfield. With title rivals Hampden Park not in league action, Sedlescombe Rangers III moved five points clear at the top of Division Five following a 3-2 success away to West Hill United II. Aidan Aspinall (2) and Stephen Davey scored for Sedlescombe, who have now clocked up 50 league goals for the season, albeit from three more games than their nearest pursuers. Daniel Wilkes bagged a brace for ninth-placed West Hill. Third-placed Battle Baptists III won 3-0 at home to Icklesham Casuals II thanks to goals from Elliot Waller, Adam Thompsett and George Harris. Battle are now just two points adrift of Hampden Park, but have played four more matches. Northiam 75 II rose a place to eighth by virtue of a 3-1 success away to neighbours Beckley Rangers. Fin Thompson, Hayden Reed and Brendon Doughty netted for Northiam, while Joe Maylam replied. Beckley have dropped to the bottom because AFC Hollington jumped above them on the back of a 3-0 victory at home to seventh-placed Herstmonceux II. There was also plenty of local cup action, including three quarter-finals in the league’s Wisdens Sports Challenge Cup - for teams in Division Two and Three. Charlie Cornford scored a hat-trick as Division Two leaders Icklesham Casuals won 4-1 away to a Hollington United II side lying fifth in the same division. Phil Badrock grabbed the other for Icklesham, who will visit Catsfield in the semi-finals. Catsfield, who are fifth in Division Three, won 2-0 away to Division Two’s bottom club, Bexhill Rovers. Division Three also got the better of Division Two in the bottom half of the draw as Victoria Baptists pulled off a terrific 4-3 win away to St Leonards Social II. Victoria will be away to the winners of the one outstanding quarter-final, involving Sedlescombe Rangers II and Sovereign Saints, who are due to meet on March 10. Hampden Park advanced to the semi-finals of the Coopers Construction Challenge Cup - for teams in Division Four and Five - with a 4-1 win at home to fellow Division Five outfit Wittersham II. Strikes by Craig Crowther (2), William Coles and Eddie Dunn won it for Hampden Park, who will visit South Coast Athletico or Robertsbridge United II in their last four. Their tie was postponed last weekend and has been rearranged for tomorrow. Three Robertsbridge Charity Intermediate Cup quarter-finals were played and the stand-out result was achieved by Division One leaders Northiam 75, who won 5-3 at home to Premier Division opposition in the form of Sedlescombe Rangers. Stephen Housago plundered a hat-trick for Northiam, and Dan Hackett and Scott Embery chipped in with one each. Ryan Edwards, Luke Graham Davies and Michael Booth scored for Sedlescombe. Northiam will host another top flight side, Hawkhurst United, in the last four after the Hawks narrowly prevailed 2-1 at home to Division One team Rock-a-Nore. At the top of the draw, Premier Division outfit Robertsbridge United won 3-0 against The JC Tackleway, of Division One, in a match switched to Sandhurst with The Clappers unfit. Paul Barnes opened the scoring with a penalty on the stroke of half time before Curtis Coombes and Barnes again put Robertsbridge through to a home semi-final against Bexhill Town and Rye Town, who are due to meet tomorrow. Division Three leaders Punnetts Town edged out Division Four top dogs Orington 4-3 away from home to reach the Robertsbridge Charity Junior Cup semi-finals. Punnetts progressed despite Adam How (2) and James McGrath hitting the target for Orington on the 3G pitch at Bexhill College. League games are scheduled in all six divisions next Saturday, plus matches in no less than seven cup competitions. Catsfield defender Ben Newman heads the ball forward against Bexhill Rovers.